The QuiltCon Charity Challenge is one of the Modern Quilt Guild‘s largest-scale charity projects. 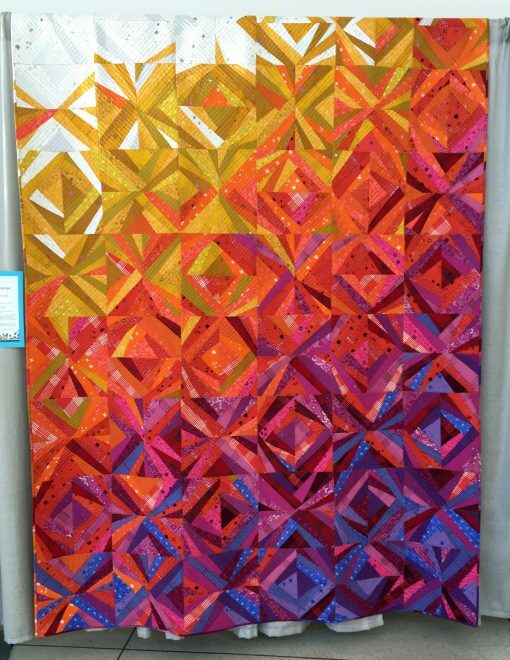 This year, guilds and individual members were challenged to create modern traditional quilts using a pre-defined color palette. All charity quilts were returned to the makers and will be donated to benefit a local charity. Here are just a few of my favorite charity quilts from QuiltCon 2018 in Pasadena, California with descriptions as written by the makers. Enjoy! 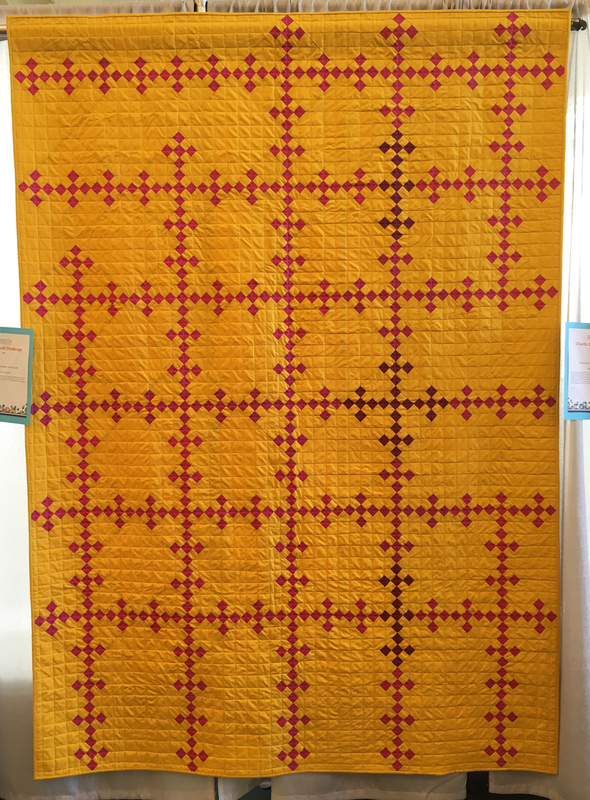 “Irish Chain Variation” by the Ann Arbor MQG. 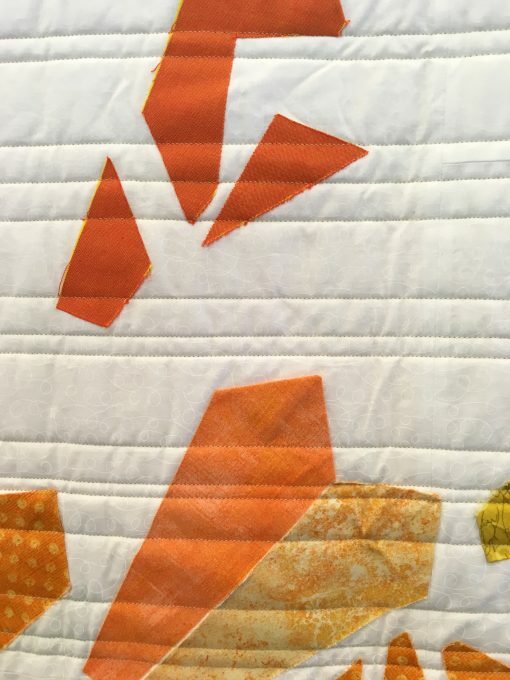 Statement: Guild members contributed to cutting fabric or stitching 4-patch blocks. Then a group of us met together at a sew-in to arrange the blocks in an on-point Irish Chain pattern. We edited the traditional layout so that there are blips in the grid. 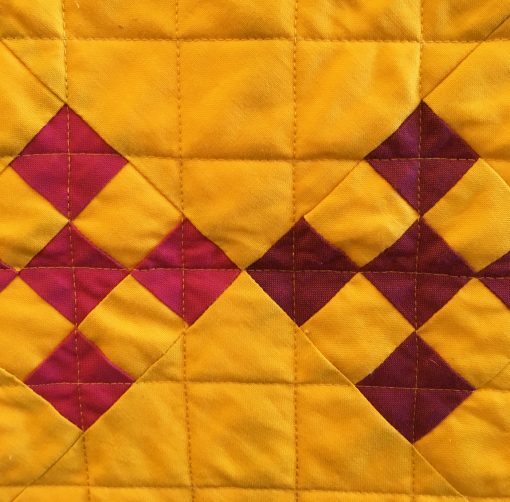 detail of “Irish Chain Variation” by the Ann Arbor MQG. “Radiant Nine-Patch” by the Cambridge MQG. 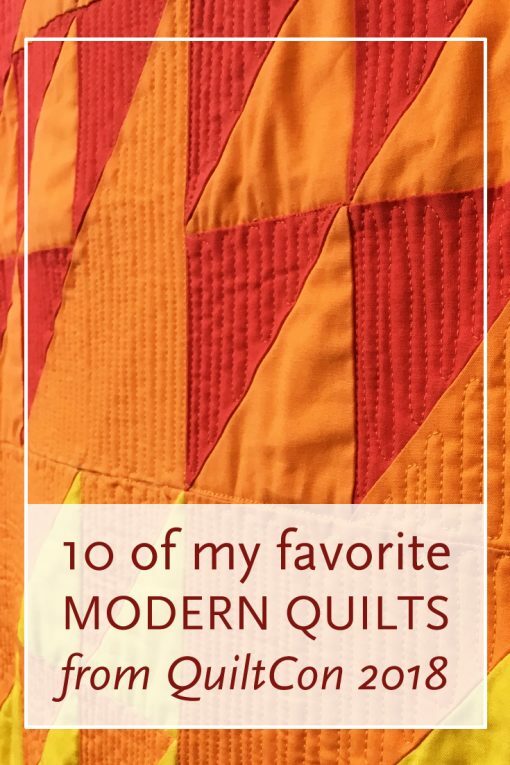 Statement: This quilt takes the traditional nine-patch blocks of multiple sizes and arranges them to radiate from a central dark core into light. detail of “Radiant Nine-Patch” by the Cambridge MQG. “Orlando Sunrise” by the Orlando MQG. 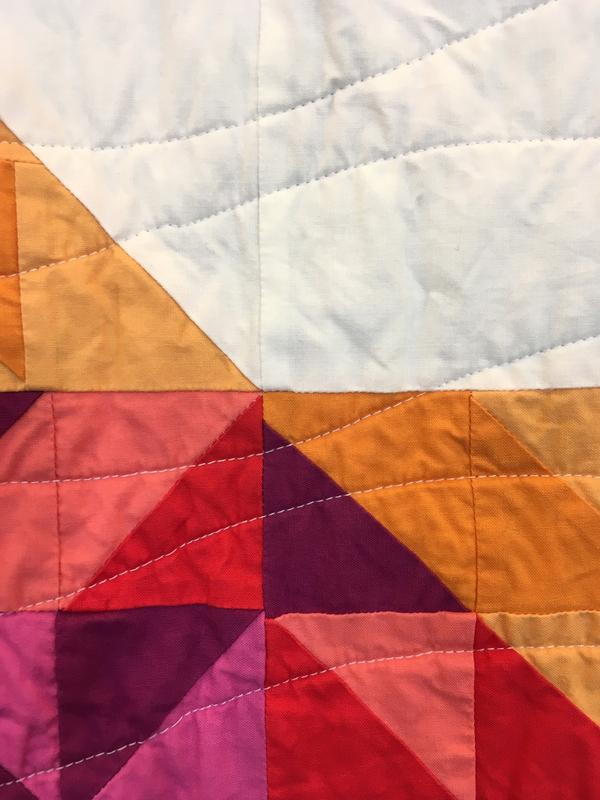 Statement: The Quilt was improvisationally pieced by our members. 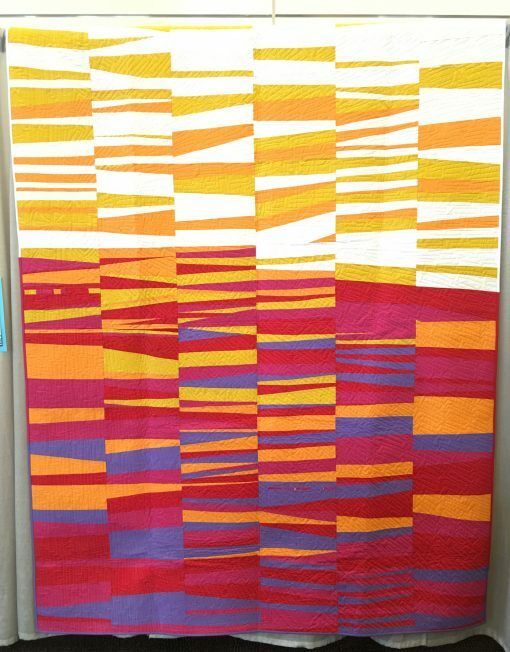 Each participant was given a range of colors and asked to piece in horizontal strips of varying widths. When it came together, it reminded us of a sunrise, a symbol of optimism and also speaks to our east coast geography. 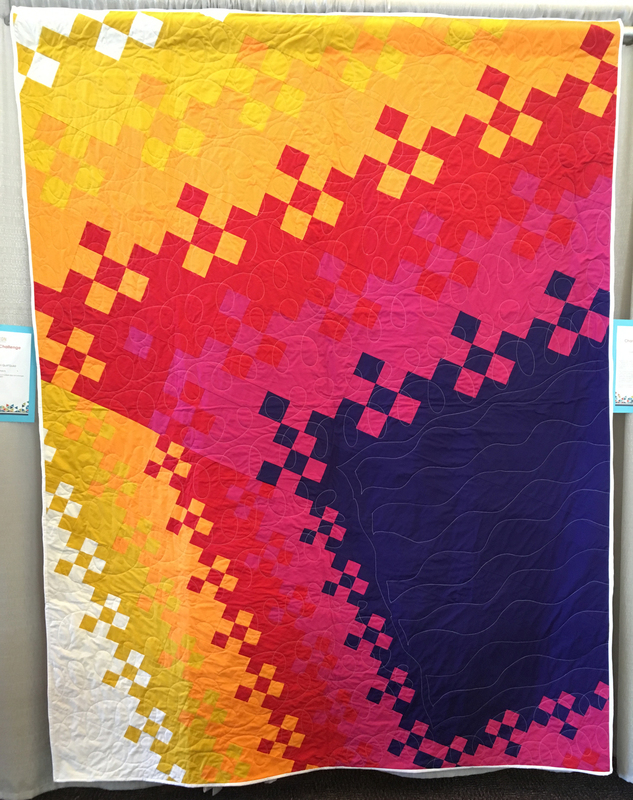 The quilt was designed by Anne Sullivan, pieced and finished by Members of the Orlando Modern Quilt guild, and quilted by Alissa Lapinsky. detail of “Orlando Sunrise” by the Orlando MQG. “There is no Planet B” by the Niagara MQG. Statement: The traditional bear paw block deconstructed is our message carried by the Arctic polar bear to California that global warming is upon us and there is no planet B. Please save our habitat! detail of “There is no Planet B” by the Niagara MQG. “Delaware Sunset” by the Delaware MQG. 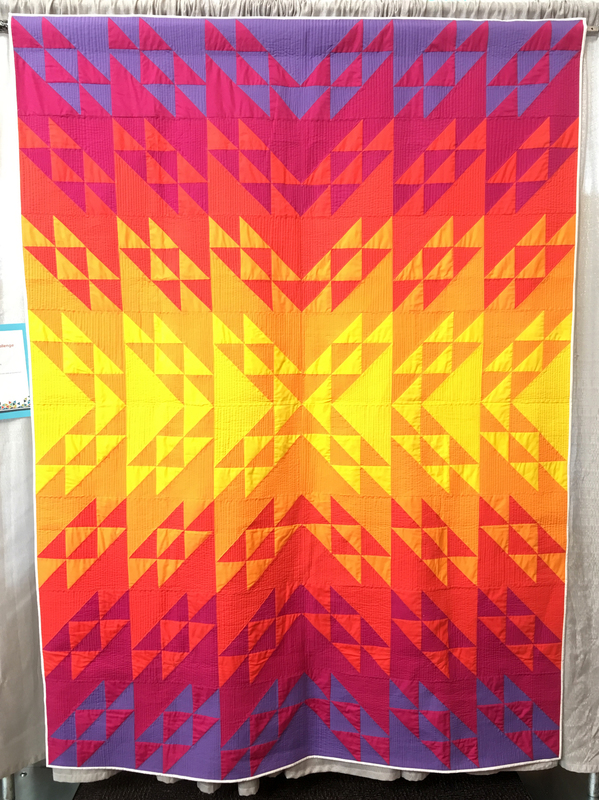 Statement: “Delaware Sunset” uses the traditional Grandmother’s Choice block at 12″ finished. To create a modern and unique design. 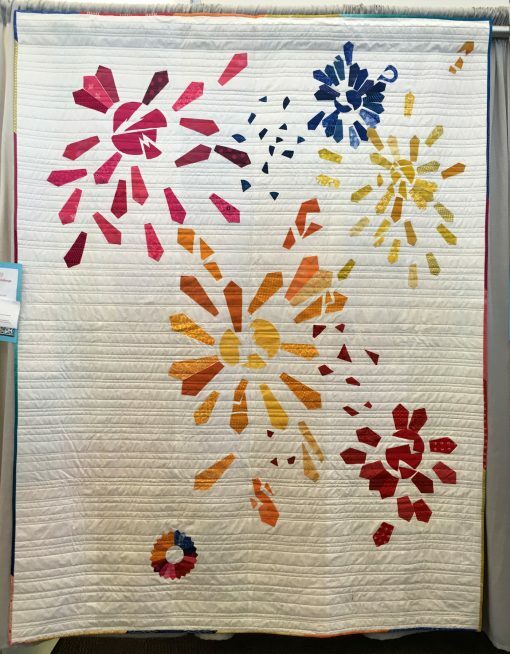 Our “sun” is focused in the bottom left hand corner, using a surprise switch of color from the rest of the design. 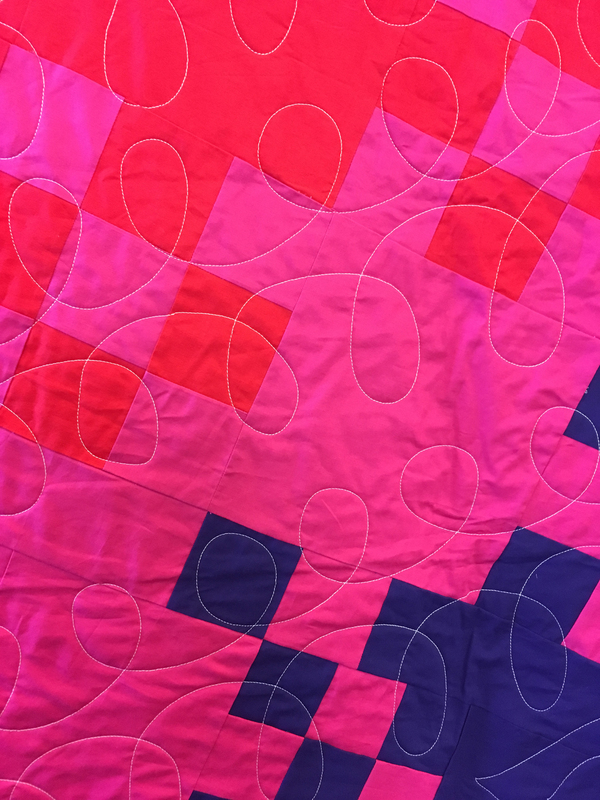 We wanted to keep this quilt simple but the finished product is anything but with a mixture of sharp blocks and curved quilting. 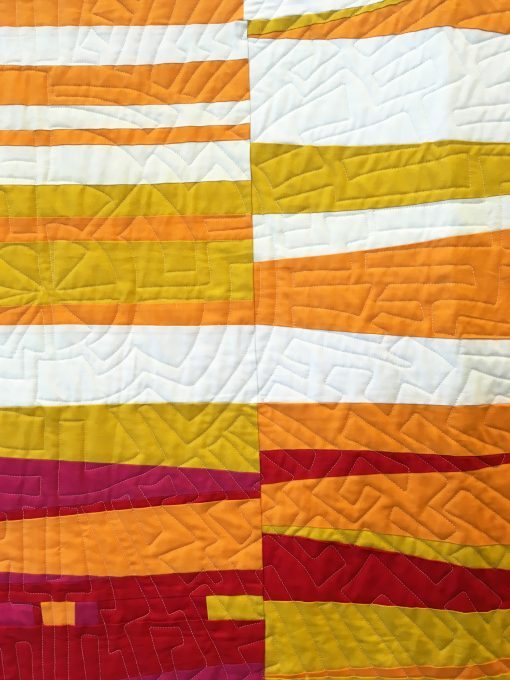 detail of “Delaware Sunset” by the Delaware MQG. “Star Power” by the North Jersey MQG. 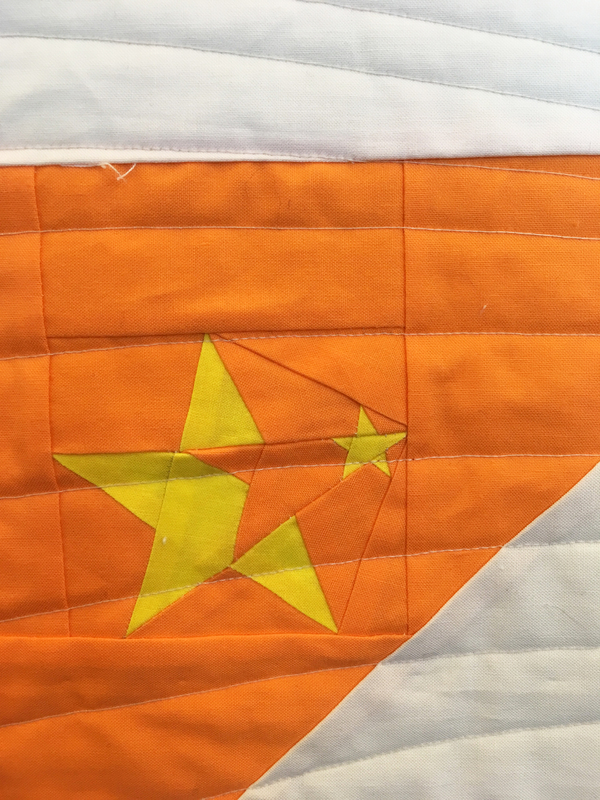 Statement: Members were given instructions to float a star of their choosing in blocks that were designed to come together with an overall design. 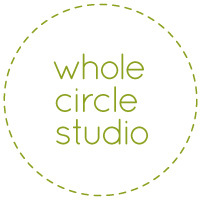 We work together a group but also shine as individuals. detail of “Star Power” by the North Jersey MQG. “Lake Superior Sunrise” by the Lake Superior MQG. Statement: “Lake Superior Sunrise” is a true community made quilt. Thank you to everyone who participated in its creation. Under the theme of Modern Traditionalism, the design of “Lake Superior Sunrise” was inspired by Crazy Quilts. The design was created to allow improvisational choices to be made by each maker within a simple structure. It was our goal to include as manyhands in the making of this quilt regardless of skill level or design experience so that it was a true collaborative experience. The overall look of crazy quilts inspired the angular lines of the “Superior Sunrise” block. In addition these lines or segments lent themselves to the overall design concept: sunrises over Lake Superior. The color palette led the way, but the desire for a fractured, gradient light pattern was the final design goal. 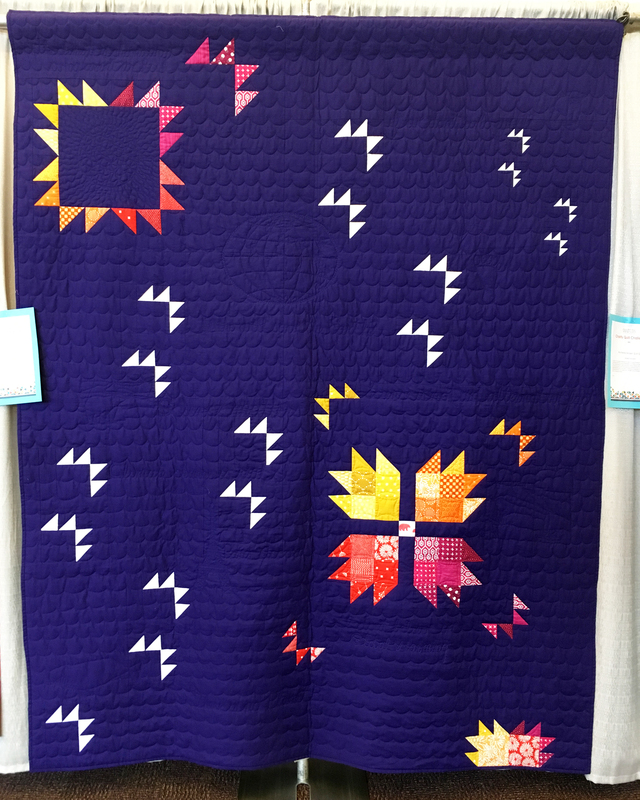 The resulting quilt was fun to make suitable for all skill levels and a true representation of our community. Foundation pieced blocks constructed by members. 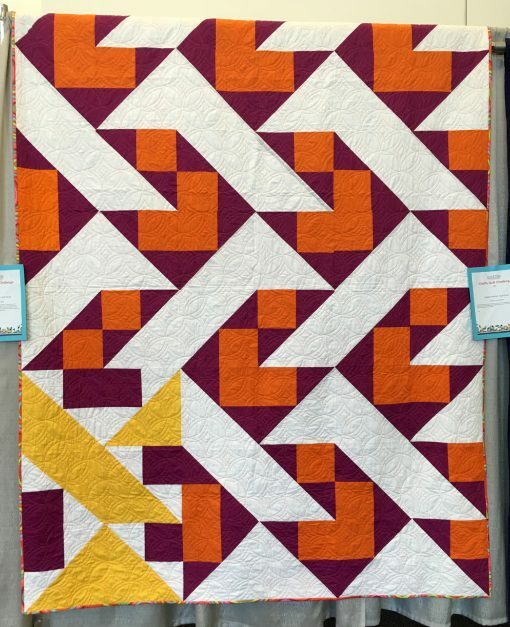 Original pattern designed by Alane Davis. Quilting designed and executed by Scott Lunt. Binding by Ruthann Grace. 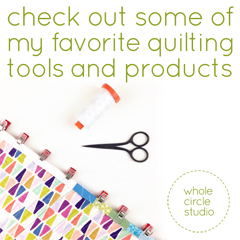 Special thanks to: Janet Anelli and Hannah Johnson Fabrics & Karen McTavish and McTavish Quilting Studio for their generous donations and enthusiatic support. 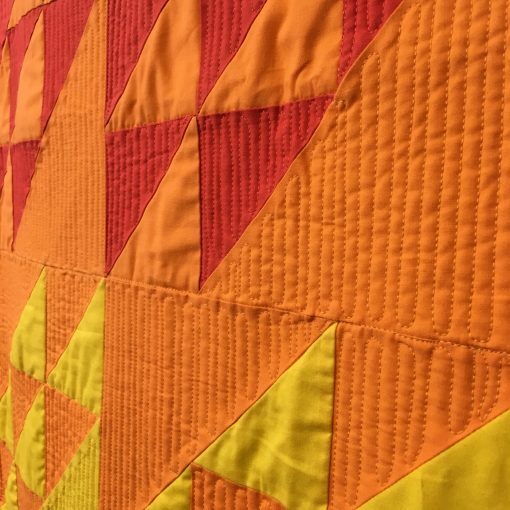 detail of “Lake Superior Sunrise” by the Lake Superior MQG. “Life in Pieces” by the Tucson MQG. Statement: Exploding Dresden plates is not an original idea (Google it) but once the idea got some traction we had fun with it. 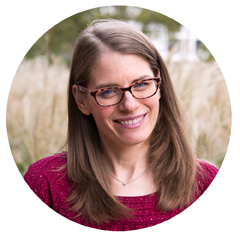 You are look at a place setting of Fiesta Ware that has been smashed on the floor—the blue coffee cup and red bowl as well as the dinner plate, salad plate and saucer. detail of “Life in Pieces” by the Tucson MQG. 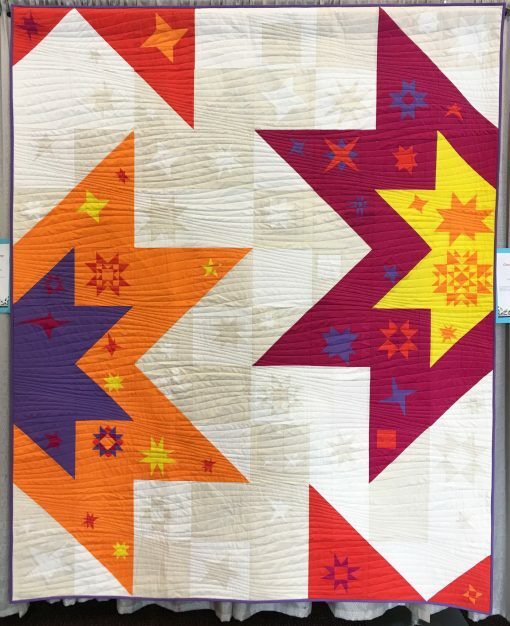 “Smoky Mountain Star” by the Knoxville MQG. 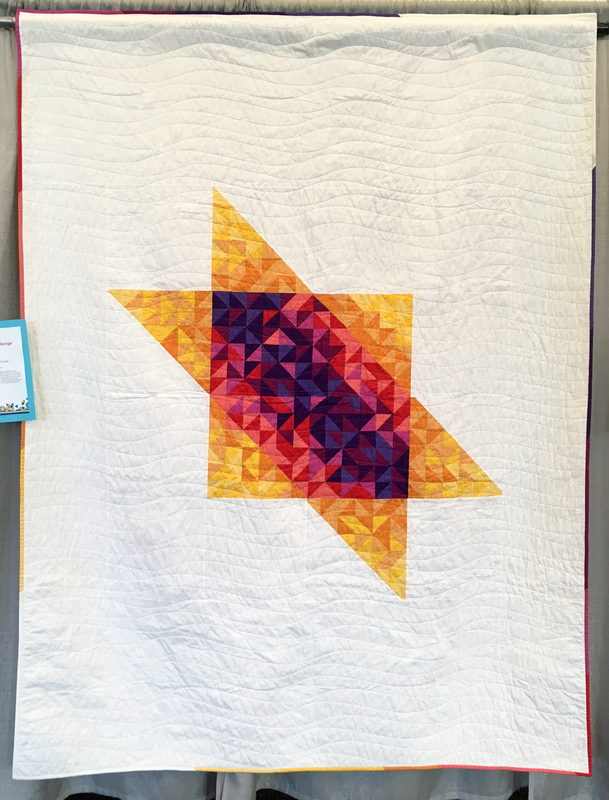 Statement: The Knoxville Modern Quilt Guild in Knoxville, Tennessee, created “Smoky Mountain Star” for QuiltCon 2018. Inspired by a traditional pattern by Bonnie K. Hunter, we took one of the signature slanted stars and enlarged it for a modern layout surrounded by white space. 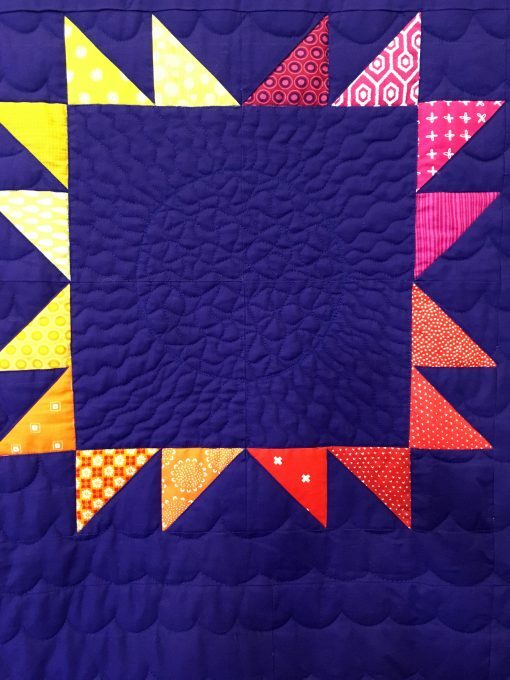 The star features the assigned color palette in a strategic arrangement of the half-square triangles, with sections of the star pieced by our members. This quilt and its inspiration reflect our guild’s location in the foothills of the Smokey Mountains and the beauty we see here every day. 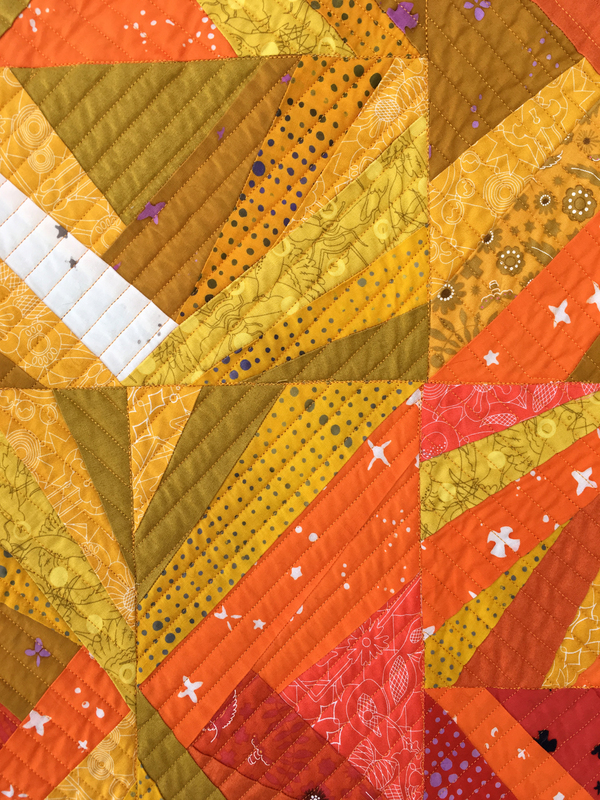 detail of “Smoky Mountain Star” by the Knoxville MQG. 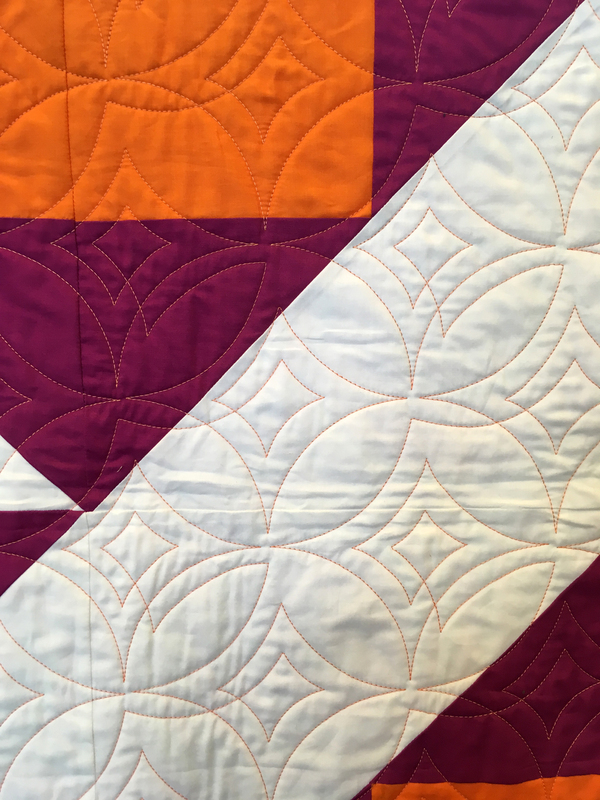 Statement: Flying geese angled in 4 directions made of the 5 color solids graduated from darks at the top and bottom to lights in the center. detail of “Palindrome” by New Texagon.